When you’re hungry, sometimes just one entree won’t do. The big appeal of buffets is that patrons can eat as much or as little as they want, while choosing from a huge array of options. No matter how many picky eaters are in your party, a great buffet is sure to fit everyone’s needs. For a fantastic feast, chow down at one of the 10 best buffets in South Dakota! Located inside the sprawling Silverado Franklin Historic Hotel & Gaming Complex, the Grand Buffet is an opulent buffet fit for guests looking to indulge while enjoying their Deadwood vacation. This Las Vegas-style buffet has over 80 feet of food serving areas, with made-to-order stations, wood fired pizzas, seafood, salad, dessert bar, and all you can eat crab and prime rib steaks on Friday and Saturday evenings. The Grand Buffet is open for breakfast (7 a.m. to 10:30 a.m.), lunch (11 a.m. to 2:30 p.m.), dinner (4:30 p.m. to 9 p.m.), and Sunday brunch (8 a.m. to 2:30 p.m.). Sioux Falls’ Hibachi Grill & Supreme Buffet is one of the best places in South Dakota for sushi. Not only that, they also serve up a huge variety of Chinese, American, and Japanese cuisine at their expansive buffet. The buffet has a huge variety of high quality, fresh, and delicious options with something to fit everyone's’ tastes. The sushi bar has so many options and everyone from first timers to sushi aficionados will find a sushi dish to enjoy. For delicious Asian cuisine at reasonable prices, you can’t beat the Hibachi Grill & Supreme Buffet. Family owned and operated for over four decades, JoDean’s Steakhouse & Lounge is a staple of the Yankton community. The 50 foot buffet is highly acclaimed and often rated as one of the best in the state. There is a little bit of everything here, such as soup, salad, desserts, meats, seafood, pasta, and many other entrees and tasty choices. The buffet is open seven days a week, with an evening buffet, lunch buffet, seafood buffet, and an extremely affordable option for just the salad bar. You’ll never leave JoDean’s hungry or unsatisfied! The Royal Fork in Sioux Falls is a favorite gathering place for foodies and hungry locals alike. The sprawling buffet offers over 30 hot entrees, a make-your-own salad bar with the choice of eight types of prepared salads, and three hot and homemade soups. If that isn’t enough, satisfy your sweet tooth at the dessert bar which has an incredible array of scrumptious sweets as well as Belgium waffles! Royal Fork is open from 11 a.m. to 8:30 p.m. from Monday through Thursday, from 11 a.m. to 9 p.m. on Friday and Saturday, and from 10 a.m. to 8 p.m. on Sunday. This restaurant also offers available space for banquet events like a wedding reception, meeting place, party, or reunion. Located just outside of the awe inspiring Custer State Park, the Custer Corral Family Buffet is the perfect place to refuel after a long day of hiking and sightseeing. The restaurant is open daily during the tourist season from May through mid-September from 11 a.m. to 9 p.m. 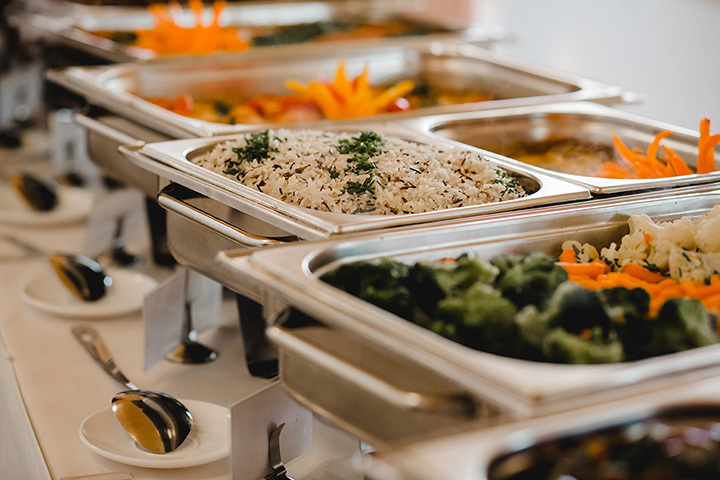 The buffet itself is packed with 55 feet of selections like appetizers, soups, salads, lunch specials, dinner entrees, and mouthwatering desserts. There are also four different cuisine stations with American, Asian, Italian, and Mexican. There always something new to try at the Custer Corral Family Buffet! For almost two decades, Golden Fortune has been a favorite Chinese buffet in Rapid City, always packed with satisfied customers hungry for more. The buffet offers a selection of over 60 unique items like Chinese entrees, sushi, a salad bar, an array of desserts, and ice cream galore. The Silk Road Cafe is a Vermillion hot spot, serving up mouthwatering Asian cuisine in a spick-and-span and friendly atmosphere. From rice dishes to meat specialties to veggie delights, there is something for everyone to enjoy at this large and tasty buffet. Cheesy and tantalizing pizza has always been the specialty of George’s Pizza and their delicious slices have made them a household name in Brookings. This family restaurant offers an extensive menu with appetizers, burgers, chicken, pasta, Grecian dishes, and, of course, many pizza options. The best item on the menu, however, is their buffets in which customers can eat an unlimited amount from the pizza and salad bar. Another of South Dakota’s top notch Asian food buffets, the Panda Garden Buffet is a must-try when visiting Huron. From savory noodles to fried veggies and perfectly seasoned meats, the chefs at Panda Garden are experts at their craft. Don’t miss out on trying this unbeatable Huron buffet! The New China Buffet is an old favorite among Mitchell locals and tourists alike. The workers are incredibly polite and friendly, greeting each customer with a warm smile and perfect service. Not only that, the food is hot, prepared fresh, and unbelievably tasty. Best of all? Customers can eat until their heart's content. Bon appetit!